Uncle Bobs are unavoidable at weddings. I case you don’t know what I’m referring to, an “Uncle Bob” is a person (usually a family member) at a wedding that fancies themselves as good as a professional photographer. They often have decent equipment and you can see them buzzing about with their camera and lens going all sorts of places you’d rather they not. A lot of times they’ll pick a moment to come cozy up to you, chat you up about what lenses you’re using, how they had a friend hire them for a wedding once upon a time. Usually this moment is completely inopportune and you’re left struggling between politeness and rudeness and trying to figure out your exit plan without totally offending anyone. Other times, they’re standing smack in the middle of your shot. Other times they’re pulling focus in a shot. Uncle Bobs can be exhausting. If the U.B. shows themselves before the wedding, I will often go up to them and say hello & introduce myself. Usually this is (happily) surprises them and they act like my buddy saying something like “I just love photos, if I’m ever in your way please let me know!” This is the most ideal situation because usually I respond with “I appreciate that! I doubt it’ll be an issue, but I’ll let you know”. Sometimes, something that simple is all they need to respect you and stay out of your way. Once I mention the eyes looking in the wrong direction, light bulbs seem to go off and they realize that I’m not banishing them just to be selfish and that my photo and their photo will be better for it. I know some photographers who refuse to allow other people take photos during the family formals, but honestly, as long as they aren’t pulling focus with the eyes and as long as there’s time, I don’t mind. They’re family of my client and they’re excited. Sometimes you can redirect an Uncle Bob’s behavior by asking them to help you. Usually I do this mostly during family formals when they tend to be the most pesky. Since they’re usually family themselves, they know most people there. I ask them if they’d help me gather the people for the next shot. Often they get excited to be useful in a “professional” capacity that they more than gladly do it. And since they’re doing my task, they can’t be messing with my shot! Occasionally, you’ll encounter U.B.’s that are oblivious to your nicey-nice ways and are just kind of jerks. They continue to shoot over your shoulder when you ask them to stop. They step in front of your shot right before you’re about to take it. They get up during the ceremony and roam around blocking guests and annoying them. Their actions impeded you from doing your job as you’re hired to do. If this happens, it’s time to get firm. Once I had an Uncle Bob (a woman this time) stand up and step in the middle of the aisle right as the bride was about to come down. I swiftly rushed to her and tapped her on the shoulder and said “You need to sit down, NOW.” Thankfully, I had 160+ witnesses of her ridiculousness and the groom apologized to me afterward for his guest’s behavior. Everyone knew my actions were for the couple’s best interests and (bonus) I didn’t have any more trouble with that woman for the rest of the night. Maybe she was mortified (she should be), or maybe she just realized she should let the professional do their job. Either way, it called for swift and firm, otherwise, I would not be able to do my job. How do you handle the Uncle Bob’s at your weddings? What techniques have (or haven’t) worked for you? 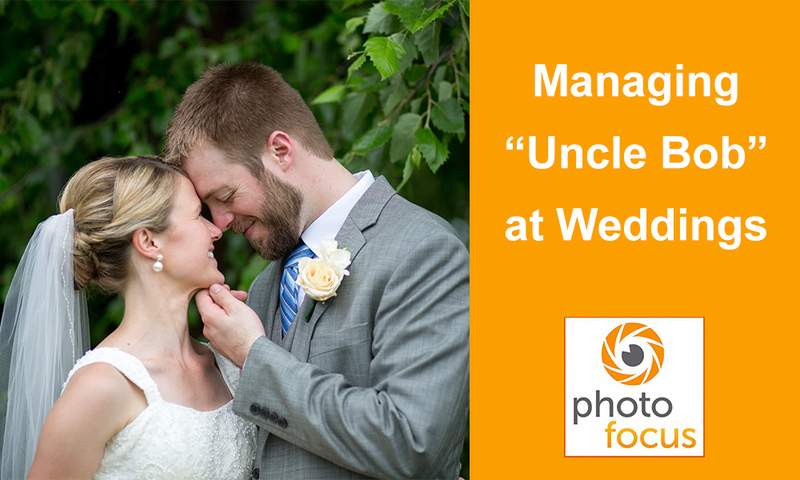 I am “Uncle Bob” and I am an enthusiastic amateur with a Canon 7D Mk II. I was recently, much to my trepidation, asked to do the wedding photography for my niece. Her requests were liberally sprinkled with many “no pressure” statements which just served to ramp up the pressure. She had also co-opted another uncle, John, to carry out the video work. We spent much time trying to keep out of each others way but the major task was keeping the happy couple focused my way. So, now I have a deep appreciation of what is involved and the people skills required to manage a wedding shoot. Foremost of which are people skills, tact and diplomacy. I take my hat off to all professional wedding photographers. You cant be part if the wedding and photograph it properly at the same time. Don’t worry uncle bob, i got this… Hey u.b, let’s get you in this shot as well…. Bob, round up the kids for a shot for me? ….